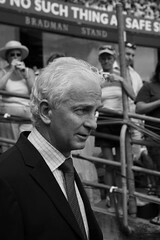 David Gower: What he said, really meant and definitely did not | Make Time For Sports. Former England skipper and commentator David Gower is dismissive of Shoaib Akhtar’s remarks concerning Sachin Tendulkar in his autobiography, “Controversially Yours”. Shoaib had the talent. He was one of the quicks in his generation. He had the pace to trouble the best. Even (Vivian) Richards was troubled by pace. There was nothing new about that. But look at Sachin’s record, his thousands of runs in Test and one-day cricket…Its all hot air, irrelevant! I understand what they are saying but there has to be a line somewhere. Its like legalising good ivory. It will increase poaching anyway. If you say its okay to do tampering, you will get a lot of tamperers. It will encourage cheating.